Next generation of symptom checkers are entering the healthcare market with the intention to disrupt the way health services are provided. Symptoms checkers have a chance to belong to the set of killer applications within digital health market next to telehealth, e-prescription and chronic health management solutions. Market potential differs significantly country per country and could go up as high as 8 Bn EUR p.a. Payer and pharma companies must hurry up to close partnership deals as prices go up quickly. There are hundreds of symptom checker solutions available in the market for long. Quite a few have gone out of business or changed their business model (e.g. Medlanes) due to having started too early in a market either using B2B or B2C business models. Over the last few years a new generation of symptom checkers have been launched. These tools are building on AI for data management and a chat bot functionality for user communication. They also expanded into other service areas not only concentrating on offering expertise medical diagnostic advice, but also allowing to search for a doctor, remote HCP consultations, or shopping features for over-the-counter medicines. Symptoms checkers have the potential to belong to the solution suite that will open up the traditional healthcare system for digital health solutions, similar to telehealth or chronic patient’s self-management services. They not only allow patients to remotely 24/7 access advice on their symptoms but are more and more used also by HCPs to support their diagnosing process. The following list of next generation of symptom checkers shows current ranges of services, reach and business models. Ada Health – a free symptom checker exclusively available as a mobile app. The app provides symptom advice on thousands of diseases. The ADA app has 6 million users and 10 million assessments completed, it’s available in 5 languages and ranked as #1 medical app in over 130 countries. 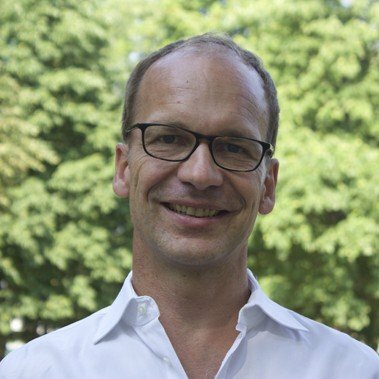 The Berlin-based company employs 130 workers and over 40 doctors and medical editors. Your.MD – symptom checker and health tracker. The app for diagnosis, partners with online medical service providers and refers its apps users to pharmacies, test centers, doctors’ offices or recommends other medical apps which are suitable for them. Sensely – an app for pre-diagnosis, video doctor consultation, allows remote monitoring, links user with local medical services and self-care resources. Currently Sensely app is available by an access code from an employer/health plan. Infermedica – Symptomate is a suite of web, mobile and voice apps that help patients assess their symptom when they feel sick. The solution covers 13 languages and is available in three major voice platforms: Amazon Alexa, Microsoft Cortana and Google Assistant. According to the company the audience includes mainly young adults and more than 55% of the users are aged 18 – 30. Some of the most commonly reported symptoms include headaches, back pains, mild abdominal pains and overall fatigue. Ask NHS – Virtual Assistant” app (powered by Sensely). A virtual assistant named Olivia asks questions about the symptoms and suggests what the problem is. If needed, Olivia arranges a call back from a “111 nurse” to discuss the symptoms further. Patients can also search NHS approved healthcare advice, and schedule GP appointments. Isabel is a similar solution to Ada or Symptomate. The end users are patients, but the company – Isabel Healthcare – also makes the APIs available to others to integrate the symptom checker into their own systems. In general, market readiness seems to be more advanced in terms of payer and user willingness to use and pay compared to few years back. Also, symptoms checkers are now seen as tools which not only substitute or shorten HCP visits by remote, anonymous and free-of-charge health assessments, but which also enable patient activation tools for pharma companies and enhance products by tech-companies. Market potential is big. 400 million people especially in developing economies lack access to essential health services. The situation in developed economies is different. Shortage of doctors, especially in rural areas also exists but the problem that symptoms checkers could address is the large amount of doctor visits. In the USA alone there are around 1.3 Bn visits to GPs in a year. Japan has an even higher GP visit numbers as people tend to go 3 times more often to a doctor compared to their US counterparts. 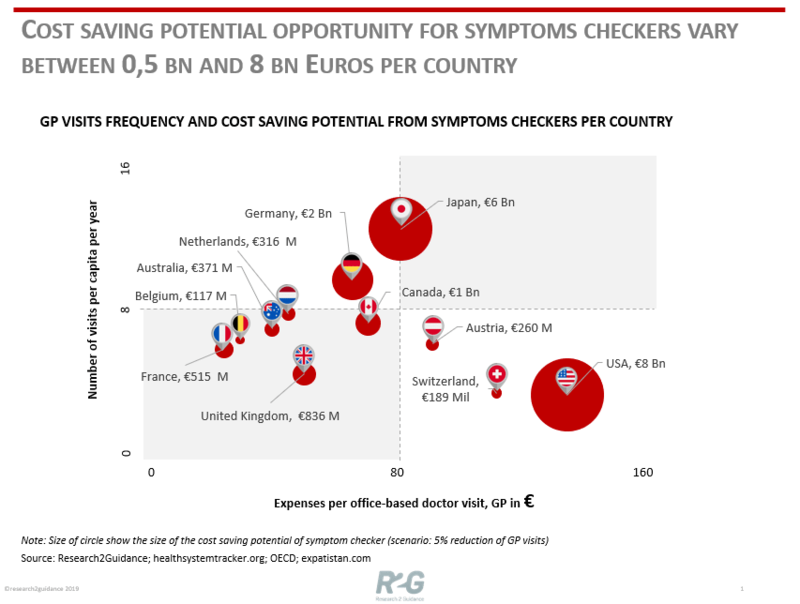 By reducing the number of HCP visits (here only GP visits are shown), symptom checkers promise to have a significant impact on healthcare costs within each country. Regardless whether 5% or 10% of GP visits will be made obsolete, the cost saving potential is enormous. In the US alone a 5% reduction would lead to annual cost savings of 8 Bn EUR! Second biggest market opportunities are in Japan with potential cost savings of 6 Bn EUR, followed by Germany and Canada (1 Bn EUR). Babylon a telehealth service also using symptoms checkers is now embedded into Samsung Health, which is available on millions of Samsung mobile devices in the UK and US, and has recently signed major partnership agreements with Tencent, Bupa and Prudential. Companies wanting to enter the market should hurry up as development times of symptoms checkers are long and existing players are closing deals with payers and tech companies at high speed. Ada, for example, claims to have spent seven years to build up their database of symptoms and recommendations, while integrating more than thousands diseases linked to symptoms curated by HCPs. On the other side, payers, pharma, hospitals and tech companies that want to enrich their service offering with next generation of symptoms checkers are urged to start selection and further on integration process of next generation symptoms checkers as prices go up quickly and flexibility to incorporate specific change requests will go down with increasing success of symptoms checkers. Reach out to us to find out more about next generation of symptoms checkers and how to integrate them into your core business.